In most parts of the United States, winter is a very cold time of year. While most owners know the dangers of hot weather, not everyone knows that the cold can be just as dangerous. AESC wants all pet owners in the area to understand the risks that winter weather can pose for our beloved pets. Winter can be hard on everyone, and our pets are no exception. As temperatures drop, your pet becomes more at-risk for cold-weather related health problems such as frostbite and hypothermia. Both of these conditions are incredibly dangerous. Frostbite is a condition in which skin and other tissues are damaged due to exposure to extremely cold temperatures. When temperatures drop below freezing, blood vessels located near the surface of the skin start to constrict, which reduces blood flow. The reduction in blood flow helps to preserve core body temperature by keeping blood in the core instead of in the limbs. In extremely low temperatures or when pets are exposed to cold temperatures for an extended period of time, blood flow to the limbs can be reduced to critically low levels, which can allow the tissues to freeze. Typically, frostbite occurs in body parts farthest away from the heart and in tissues with a lot of exposed surface area. 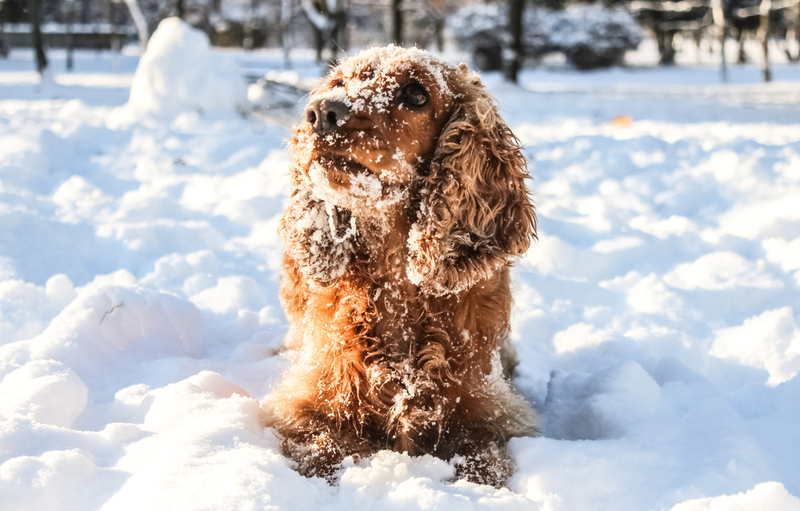 Paws, ears, and the tail are often the most at-risk for frostbite in pets. In severe cases, amputation will be necessary. Hypothermia occurs when body temperatures drop too low. In dogs and cats, the normal body temperature range is between 99.5 and 102.5°F. If body temperature dips too low, your pet will start to experience hypothermia. At this point, your pet is losing body heat faster than it can be replaced. Hypothermia can be fatal if it is not treated properly. Often, these two conditions are intertwined. When that is the case, be sure to treat the hypothermia first, as it is affecting vital internal organs. Frostbite symptoms may take a few days to show up, especially in areas that your pet doesn’t use much, such as the tip of the tail. In cases of severe frostbite, the affected areas can become necrotic or die, which not only looks bad, but it can also lead to infection. When your pet’s body temperature drops to a certain level, it may be very difficult for them to recover. If you start to see signs of hypothermia, bring your pet in for treatment right away. Treating these conditions as soon as possible is extremely important to the welfare of your pet. Both conditions can do irreversible damage if not properly treated in a timely manner. Frostbite and hypothermia can be very painful, but never give your pet any pain medication that isn’t prescribed by a veterinarian. No matter what, it is best to bring your pet in to see a veterinarian for treatment, as some at-home methods to re-warm a hypothermic or frostbitten pet can actually do them harm. We recommend that you try to warm your pet up as you bring them into a hospital with warm towels or blankets. If you already have your pet warmed up, continue to keep them warm on the way. 24/7 emergency care hospitals like AESC have the equipment and expertise needed to rewarm your pet safely while also addressing any resulting internal or tissue damage and managing pain. The best way to prevent frostbite and hypothermia is to keep your pet from being outside in the cold for too long—especially if there is snow on the ground. Dogs that have short fur are more at-risk for frostbite and hypothermia. Any pet that is sensitive to the cold, including small, older, and short-haired pets should be kept inside the home as much as possible. Only let your pet outside for short bathroom breaks if needed. Jackets and booties can help keep pets warm when they do need to go outside to help reduce heat loss in the cold, which is the best way to prevent hypothermia. If you believe that your pet is experiencing either of these conditions, bring them in to see a veterinarian right away. For those of you in the Parker, Colorado, area, AESC’s emergency clinic is open 24 hours a day, seven days a week to treat all kinds of health issues including both frostbite and hypothermia in pets. The holiday season is quickly approaching. With only a few weeks until Thanksgiving, Hanukkah, and Christmas, it is important that you are aware of the hidden dangers that may cause trouble for your pets this holiday season. AESC has all the information you need about the potential hazards of the holiday season. When we think of the holidays, we often think of all the great foods that we get to enjoy. If you and your family are in the habit of leaving food lying around during the holiday season, you may want to change your ways to keep your pets safe. Dogs and cats—especially cats, if you listen to proverbs—are curious creatures. Food smells good, so pets are likely to investigate. If you have a pet, keep food out of reach. For owners of cats and large dogs, this can be a bit challenging. You may want to consider keeping pets locked in another room when you have food sitting out. If you are hosting guests, you may want to stress the importance of not feeding people food to the pets. Even a well-intentioned nibble could be dangerous if your pet is given the wrong scrap. Ask guests to pick up any dropped food as well. Once your meals are complete, you should go ahead and clear away the food and get it put away. This gives your pet less of an opportunity to get into all the goodies you enjoyed. If you are leaving some goodies out to nibble on throughout the day, you should put them somewhere that your pet can’t access like the middle of the dining room table or on the counter as far away from the edge as possible. You will also want to keep an eye on the trash cans. As food gets tossed out, your pet is likely to investigate. There might also be decorations and gift wrapping in the trash that could cause problems for your dog or cat. Use a trash can with a lid or take the trash out often to prevent your pets from getting into mischief and consuming something dangerous. While it is easiest just to skip sharing holiday foods with your pets, there are a few food items that your pet can enjoy. We have created naughty and nice lists of the foods that you can and can’t share with your pets. While these snacks may be ok to share in your pet’s food area, we always recommend against feeding your pet at the table, as it rewards for bad behavior and is also what leads to pets to eating things they shouldn’t. Sweet potatoes and yams (without any marshmallows or brown sugar): Sweet potatoes are a good source of vitamins and minerals for pets. Make sure that you give your pet pieces that are easy for them to eat. Cooked and raw sweet potatoes are both safe for cats and dogs as long as they aren’t covered in butter, marshmallows, brown sugar, or nuts. Cranberries: Cranberries and cranberry sauce are staples of the holiday season. Unsweetened versions can be shared with your pet in small amounts. Carrots: Both raw and cooked plain carrots are good for your pet. Green beans, peas, and other greens: Green vegetables contain all kinds of nutrients. As long as they are plain, they are great sharable foods for pets. Potatoes: Plain cooked potatoes are also safe for pets to eat—just skip the butter, milk, and salt. Be sure to remember that while cooked potato is a healthy snack, raw potatoes are very toxic to pets and can even be fatal in large quantities. Dog/cat treats: The best thing you can give your dog or cat over the holidays is a treat designed for their species. They’ll enjoy their treat, you won’t have to share, and danger will be avoided altogether! While these foods are safe for pets, make sure you aren’t overindulging your pet. Big changes in diet can lead to gastrointestinal problems and make your pet feel crummy. A little here and there won’t hurt, but make sure you are keeping it to small amounts to avoid any problems. Chocolate: You probably know that dogs can’t have chocolate as it is toxic to them. Keep anything containing chocolate away from your pets during the holiday season. Turkey or turkey skin: The amount of fat in turkey is too high for your pets. Ham: Ham is very fatty and can lead to pancreatitis in dogs. Yeast dough: Any dough that contains yeast can lead to gas and bloating problems for pets that can require a trip to the veterinarian. Baked goods and sweets: Sweets can make your pet sick. Additionally, xylitol, a commonly used sweetener, is extremely dangerous for animals. Bones: Cooked bones can splinter and lead to choking and other injuries. Gravy: The high levels of fat and salt in gravy make it a bad treat for pets. Alcohol: No amount of alcohol is safe for pets. Make sure drinks aren’t left unattended where your pet could reach them. Onions: Onions and anything containing onions, including stuffing, can be dangerous for pets. Grapes or raisins: Both grapes and raisins are incredibly dangerous for pets. Keep anything containing either away from your pets. Nuts: Macadamia nuts and walnuts are toxic to pets. Avoid giving your pet any nuts during the holiday season. Christmas trees: Cats like to climb on things, and Christmas trees—both real and artificial—are likely to fall on top of your cat while they are climbing on it. Christmas tree water additives: The water treatments used on Christmas trees contain chemicals that are toxic to pets. Keep your pet away from this water. Tinsel and ribbon: Both of these items look like toys to our pets. If accidentally ingested, these items can lead to blockages in your pet’s digestive system. Ornaments: Pets, especially cats, might attempt to play with ornaments on your Christmas tree. It is best to get plastic ornaments that won’t shatter if knocked off the tree. Additionally, make sure ornaments are out of reach or large enough that they can’t be swallowed. Gift wrap: Try to keep gifts away from pets. Ingesting any part of the gift wrap can lead to an obstruction in your pet’s intestines. Additionally, there could be items in the gifts that cause problems for your pets. If you are putting food in a gift or stocking, make sure that you keep that gift out from under the tree where your pet could get into it. Lights: The main risk with lights is electrical shock, but pets can also be burned by the cords if they chew on them. When you string lights in your home, yard, or on your tree, try to keep the cords off the ground. Flowers and plants: Holly, mistletoe, and poinsettias are all toxic to dogs and cats. Additionally, amaryllis and lilies are also dangerous. Candles: Candles are popular decorations for many holidays. A burning candle can start a fire when knocked over. It is best to keep your pets away from candles and make sure all candles are blown out completely before you leave your home. Additionally, the hot wax can burn your pet if they knock the candle onto themselves. To pet-proof your candles, use flameless alternatives. Potpourri: Both dry and liquid potpourris can contain harmful ingredients for pets. In fact, potpourri can be toxic to dogs and cats, depending on the chemicals that it is made of. It is best to keep these out of your home or to keep them out of reach of your pets. The holidays are a time for celebration. While some pets enjoy crowds, many don’t. If you are hosting a party, you may consider keeping your pet in a separate room during the festivities. This separation can prevent your pet from becoming too anxious, and it gives them a quiet space of their own to escape the commotion. In this room, you can place your pet’s bed, crate, toys, and even a treat or two to make them feel a little more comfortable. If you aren’t going to keep your pet secluded, you at least need to give them the option to get away. This means leaving a door into a quiet room open for them. Additionally, you should alert your guests to be careful as they enter and exit your home. You wouldn’t want to spend the day searching the neighborhood for your frightened pet. It is also your responsibility to keep an eye on your pets throughout the coming and going to make sure that they don’t make a run for the door. In preparation of the holidays, you should also make sure that your pet has proper identification. Get updated tags if needed. Additionally, this is a great time to get your pet microchipped. A microchip can help you get reunited with your pet in the event that your pet slips out the door. For more information about holiday pet safety, contact AESC today at 720-842-5050. Our emergency care center is open 24 hours a day, seven days a week, including holidays. If your pet ingests something they shouldn’t or gets injured in any way, give us a call or come into the clinic for care.